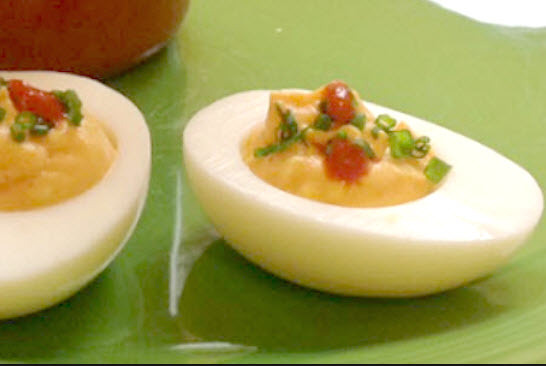 Bake a cake, sear a filet, roast or fry a chicken, fry potatoes, stir-fry vegetables, etc. One skillet is all you need, but because cast-iron cooking is lot of fun and makes the food you cook taste great. You will probably want more than one cast-iron pan. Always preheat your cast-iron pan before adding the food you want to cook. With a cast iron pan, you can begin your recipe on the stove top, and then move it to the oven to finish. Do not use a cast-iron pan in your microwave. If you do, you will ruin your pan and also your microwave oven. The fireworks display that will result will not be worth the cleanup and replacement cost. The first most common mistake of why people do not like cast iron is that they say everything sticks. If food sticks to your cast-iron pan, your pan is NOT seasoned right and you need to re-season it. Cast iron is a natural non-stick surface and if your pan is seasoned correctly it WILL NOT stick! Check out my web page on restoring and seasoning Cast-Iron Pots and Pans. 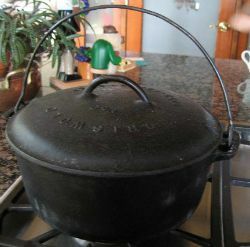 Before anyone ever thought of a crock pot, there was the cast-iron Dutch oven. Dutch ovens have been used for hundreds of years. Nothing will hold a good, even temperature better than the heavy metal of this monster pot, and it can go from stove top to oven to campfire without missing a beat. Check out this very interesting and informative article on Dutch Oven Camp Cooking. Want to make the greatest pancakes you’ve ever eaten? Want your French toast to have that crispy edge so prized at breakfast time? You need to get a cast-iron griddle pan and get it good and hot on the stove top. They work fine on electric or gas ranges, or over a campfire if you are so inclined. Choose the size most comfortable for you. I recommend the 10-inch cast iron frying pan as it is the best trade off of size and weight. Personally, I own 10- and 12-inch models because on occasion, I am called on to feed large groups of people. This style of pit cooking is also know as “Bean Hold Cooking.” If you have the time and place to cook your holiday turkey in an outdoor pit, wouldn’t this make a great Thanksgiving or Christmas turkey dinner. A pit barbecue is an exercise in turning a hole in the ground into an oven with hot coals provide the heat.